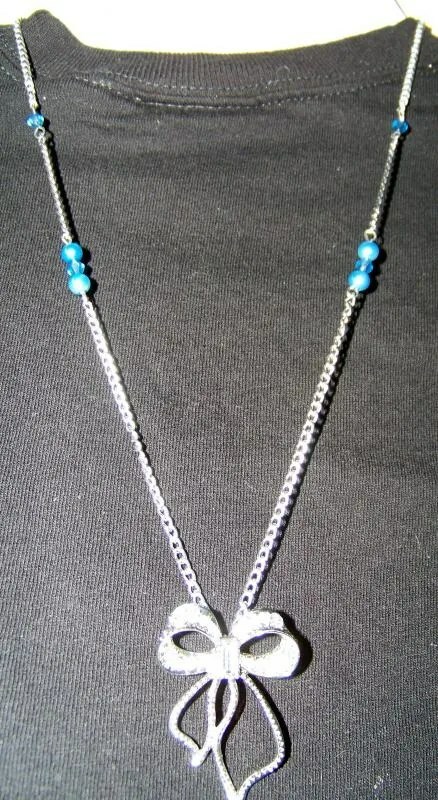 I finished my daughter’s necklace the last minute. She spent her actual birthday weekend with her dads [her day finally landed on his weekend! he deserves a full birthday weekend with her!!] She came back with pierced ears too! She was so proud telling her dad that I can make her earrings. She loved all her pieces and now wants me to make her more earrings. This was the piece that she wanted. 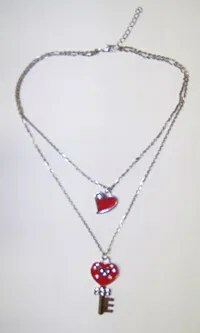 For some reason, I could not find her birthstone rhinestone chain so I could not recreate this, but for “copyright” purposes, I opted not to make it look as “copied” as possible. Besides, I don’t want to send her to school all blinged up either. so i made it as simple as possible. bracelet image coming soon…i have to find where she actually misplaced it. Still no new jewelry pieces, if anything I just added more beads/charms to my to do box. I’m just not as inspired as of late. My son and I scrapped the idea of building a doll house for Barbie, I mean my daughter. After realizing how much room it will take up in our home, not to mention all the other goodies that are coming for the holidays, and the plan on renting a room to a total stranger coming 2013- it’s now in the back burner. Seeing how my princess still plays with ALL of the dolls on a regular basis, I thought, you know what? just build the furniture and save up for a shelf where it will go at the end of the day, make a platform of some kind and hopefully, she can make it work. Off to Dollar Tree I go! I still have left over foam board so the wall and platform are underway so my princess can set up the furniture on it. 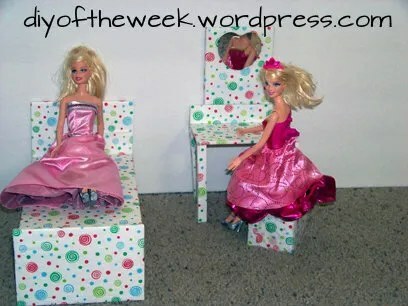 At least for now, Barbie has a bedroom set, then all my princess has to do is set it up as she needs to. 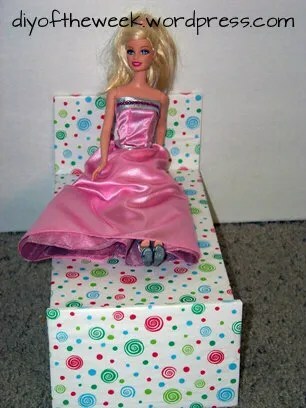 Here’s Barbie’s bedroom set made entirely out of foam board, and left over gift tissue. The stool is made out of an empty sandwich box. I’m contemplating on buying a sewing machine at Big Lots, let’s see how if I can figure out a way to budget and be able to get this – then I’ll be able to make Barbie a bed sheet, and pillows. Gotta tell you – I’m starting to like these foam boards!! I couldn’t make up my mind as to what jewelry piece to make. 9/22 is coming up and I still have not finished the piece that I’m making for my daughter. I just don’t have it in me lately. But, I knew that I have to do something about my daughter’s Barbie clothes. I can’t for the life of me find time to figure out where the right shoe is, or where that top went. I already made the hangers – so why not make the closet? So – I went to dollar tree and decided to make one out of foam board. My daughter thinks it’s a finished product and started using it. I’m letting her play with it for now since I made that as a prototype until I find the materials that I really want to use for it. It needs to be decorated—by her, but I still need to buy the embellishments for it. 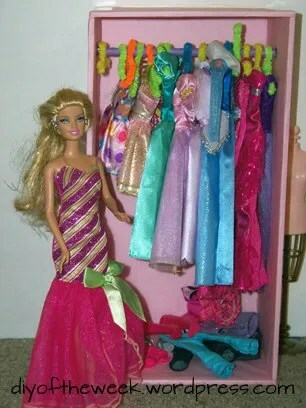 Tunrs out, I measured the closet based on the dress length and not Barbie’s height. So I definitely have to make another one-one of these days. My other hobby is calling me – a new Korean drama premiered today and I’ve only been waiting for this drama since December of last year. So Barbie will have to wait until she gets a newly made closet. For now – here’s her closet made of foam board, pencil, and left over gift tissue. 1. I need to have an alarm to remind me that I HAVE A WEEKLY BLOG TO UPDATE!! I apologize for not having to post last Sunday. 2. My paycheck told me that I can’t buy supplies this week for a trendy looking jewelry piece, so I have to make do with what I have. 3. What I have isn’t inspiring me at the moment, or that I’m not inspired at all….must be the whole back to school thing, and the fact that now I have to budget my time, and money – to make projects and still make their lunches/snacks the night before…it really is hard doing things on my own, and still find time for me and my hobbies. My son and I agreed to build her something for Christmas, but he and I have different views of what to make her, so we’ll see how that goes….anyway, she went to her dad’s last Friday, and left her dolls on the floor. Looking at the pile of clothes, I knew I had to do something DIY. I have a foam board, glue, gift tissue paper—I can make her a closet!! 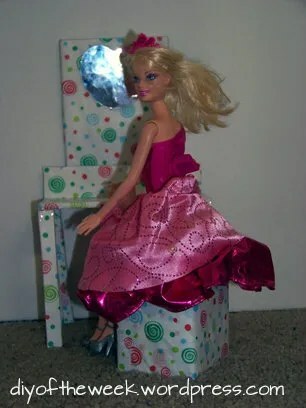 So, I grabbed the ruler to start measuring the board, then it hit me- She has 2 more dolls hiding in the closet for the big day, and I’m sure she’s gonna get more clothes from my aunt, and not to mention another Barbie movie and doll coming home for Christmas, and a couple more Disney princess is coming for the holidays too. I need to hang these up and see how big this will be. Let’s just say that the closet is on hold, until I hang ALL of the clothes that she has now. But….gosh darn it, I have no Barbie hangers. 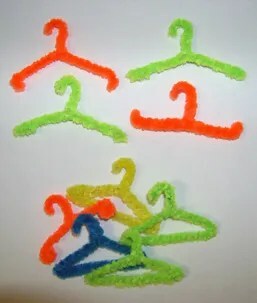 Must go to ebay and get hangers. Snap!! I can’t spend money on my DIY the next couple of weeks. Look around the apartment, and see what I can use to make hangers…..
After looking at my craft and school supplies boxes, I found: Fuzzy stick, paper clips and Christmas ornament wires, I’m sure I can make hangers out of these….. Okay – after a few trial and errors, I think I got the hang of this..here’s the finished product. I’m liking the whole DIY hangers because I am able to customize the length, so it won’t fall off. I took a break and decided that I can no longer eat another peanut butter sandwich, I went to my local dollar store to see if I can at least get noodles or something, but they said that I have to spend $7 bucks to use my debit card…I’m only missing 2 more items, so I looked at the register and found a key chain, that will match one of the charms [also from a key chain] at home, and turned behind me and saw this multi strand necklace with rings…grabbed those, went home, ate my lunch, and made my princess another necklace to add to her bday box. I call this piece, Key to MY Heart.